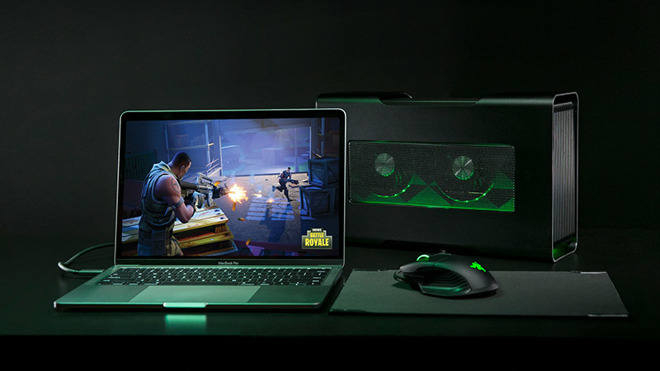 Core X is the first of Razer's Core eGPU lineup to feature Mac support, and sits below the Core V2 on the company's product totem pole at $299 without graphics card. Core V2, which also received macOS today, will remain on sale as Razer's high-end enclosure option. Designed to provide a graphics boost to Windows ultrabooks, Core X incorporates a comprehensive set of components that makes it an ideal break-out option for Mac gamers, power users who require more graphics horsepower than Apple's stock configurations, and casual crypto currency miners. Both powerful and — relatively — portable, Core X boasts a solid mix of performance, efficiency and future-proofing features with few concessions. A single Thunderbolt 3 cable with USB-C connector ferries data and power between the eGPU and host machine, with support for PCIe graphics cards like NVIDIA GeForce, NVIDIA Quadro and AMD XConnect-enabled Radeon and Radeon Pro cards. Inside, the enclosure sports a beefy 650-watt ATX power supply, up from the custom 500-watt slim form factor PSU found in the Core V2. 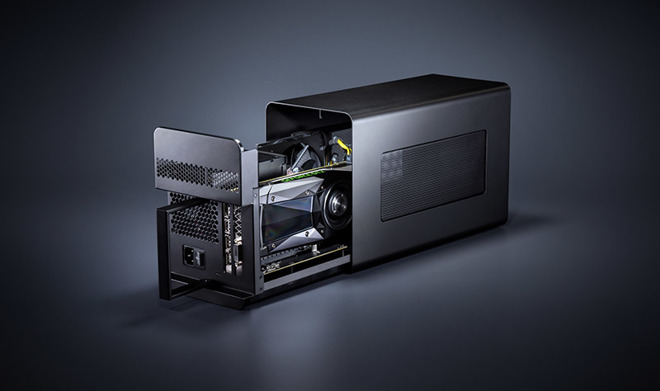 Offering a sense of what Razer means by future-proofing, Core X dedicates 500 watts of power to GPU operation, capable of powering two NVIDIA GeForce GTX Titan X cards despite having enough room inside to fit only one. Another 100 watts goes to laptop power delivered over the single Thunderbolt 3 connection, more than enough to accommodate Apple's latest 15-inch MacBook Pro models. Core X's roomy innards fit 3-slot cards measuring up to 330mm in length and 160mm in height, a cavity large enough for oversized cards like those based on the popular GeForce GTX 1080 Ti architecture. To install a GPU, users simply slide the component drawer out from the aluminum chassis, pop a compatible card into the PCIe slot and lock it down with a thumb screw. No tools are required for installation. A built-in, mesh grill venting system with integrated desktop cooling keeps the interior within thermal limits. At $299 and with a more complete set of capabilities than Core V2, Core X could be one of the best eGPU options for Mac. Razer told AppleInsider it was able to achieve a low cost basis by incorporating a standard power supply rather than custom-built unit, reducing the number of ports to a single Thunderbolt 3 connection, going without Razer Chroma LED lighting and utilizing a cast aluminum enclosure, among other cost-cutting measures. Core X is available today from Razer for $299 in the U.S., Canada, China, France, Germany and the UK. The device will launch soon in the Nordics, Australia, Hong Kong, Japan, Singapore and Taiwan. AppleInsider will be providing an in-depth review of the Core X in the coming days.